Adventure like many things and can be quite subjective onto what adventure actually means for you, but I feel it’s something we all need more of. 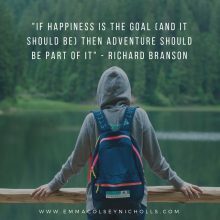 Richard Branson quote – If happiness is the goal (and it should be) then adventure should be part of it. To feel the sense of pushing your own boundaries, to experience growth of doing the things that scare you, going in seek of new experiences. Again I point back to retreats and this is another big reason I run them I feel we all need more excitement and fun in our lives. It’s also why I do spartan races, there are an adventure that also taps in for my desire to want to feel fit, strong and like a complete badass. So to ask yourself, what feels like fun to you?? What scares the absolute bejesus out of you?? What is something that you have thought I have always wanted to do that or to go there? Put these things on your dream life map in your planner. Being in the outdoors is always up there for me as is wanting to travel and visit new places. Have a big brainstorm and write down the things that would feel like adventure to you, think of it as your bucket list. What are the things you want to do and experience at least once in your life. Then go and make the decision that you are going to make those things happen. So there you have it!! We have come to the end of this 7 day challenge. But like I have said continually, it isn’t just about these 7 days. They were designed to spark the inspiration and desire to have some tools to go after these things in your life so that you can live a happy fulfilled life and remove so much of the stress and overwhelm that get’s in the way of the good stuff. Life gets to be amazing when you choose to focus on these habits of happy and get out of your own way. I am so excited for those who have already decided to immerse into this work on a whole new level by joining me on the 90 day Focused Mind, Fierce Body coaching. The time is NOW and I can’t wait to get you started. CLICK HERE to secure your place now.